Comic Book Review - The Vision #7 - Honk if you love justice! 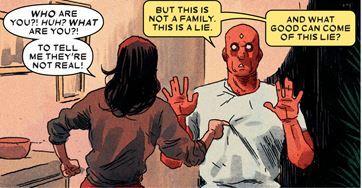 The Vision #7 , as usual, plays with expectations. You might think, considering the big tease at the end of the last issue, with Agatha Harkness warning a bunch of heroes about the Visions going off the rails, that you’d see some fallout from that. Maybe Cap going to talk to Vision, or T’Challa or Tony. Instead, we get taken back into the past, when Vision and the Scarlet Witch were together. It’s skillfully used to inform on what’s happening today, the nightmare that the Vision has created. 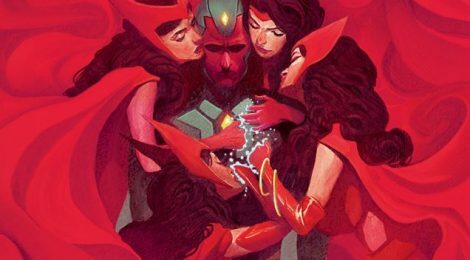 It’s a great set-up if you are coming in to the comic without knowing the twisty, convoluted background of the whole Vision/Wanda/Wonder Man thing, and really illuminates the tragedy of it all. All of the Vision’s history has brought him to this point. Michael Walsh fills in admirably on art this week – an issue like that, almost all flashbacks, is a good one if you need to have a fill-in artist step up. I run out of superlatives for the rest of the team but it’s all good here again, man. Next week will bring in the Avengers…I hope they survive the experience.